At the end of our last class, I stated that in this session we would discuss the Art and Science of the Renaissance. I reconsidered, however, the best way to group and connect our topics, and tonight we shall talk only about the art and architecture of the Renaissance, and next time we’ll discuss science in connection with politics and economics, for the three are tied together in what one could call the “Project for the New Atlantis,” a concept I’ll explain then. The art of the Renaissance is at the same time justly famous for its enormous technical achievements while, sadly, it illustrates the central idea of the Renaissance, that European man had turned away from God to Man as the center of all things. There is a powerful image I recall from the writings of the famous art historian Ananda K. Coomaraswamy, a Platonist who was extremely critical of modern culture. He said that the art of the Renaissance was born in the charnel house (a great common tomb, a building where corpses were piled), and he meant it in two senses – that at this period artists started studying anatomy using dead bodies, and that the art portrayed only corruptible earthly nature, nothing spiritual. Superfcially it looks vitally alive, but in essence it’s dead, because it is strictly of this world. A very apt expression! What the technique of 3-D perspective does is actually give the illusion of the naturalworld, and it traps the viewer in itself, in what is really an unreal world. Perhaps you can imagine going into the picture and walking around in the world the artist has created, but this is purely imaginary and in essence delusional. The technique is very clever, as are many achievements of modern Western man, but it is a dead end. One could excuse using this kind of art for relaxation, perhaps, for “entertainment,” but it actually dominates the religious art of the period. It is the outward, artistic expression of the post-schism “spirituality” dominated by the imagination and various manufactured psychic states. Another aspect of Renaissance painting that departs from the iconographic tradition is contemporaneity. Icons depict a timeless world; they point to eternity. The Renaissance painter takes great pains, on the contrary, to depict Biblical scenes and figures in the bustling, worldly society of his time, going to great lengths to insert countless details of costume, setting, and so forth that trap the viewer in 16th century Venice or Flanders. He uses specific personalities of his society as models – a cruel, avaricious cardinal to depict a Father of the Church, an immoral woman to depict a holy virgin martyr, and so forth. It is a glorification of his own time, his own society, which he sees as a wonderful period in history, a time of freedom from the old constraints and celebration of the worldly. He has reduced the eternal to the temporal. While icons depict the Lord, the Mother of God, and the Saints as serene and without the disturbance of the passions, Renaissance painting, with great skill, depicts the most sacred fgures, even Christ Himself, exhibiting passion, in which is inherent changeability and corruptibility. Our Lord, of course, voluntarily took upon Himself our blameless passions, in order to suffer with us and ultimately die for us, though He was not of necessity subject to passions or to death. But He was always in control of the blameless passions and of death itself, their ever-calm and absolute Master. Countless Renaissance depictions of the Passion and Crucifixion show a corruptible, merely-human Christ in the helpless throes of pain and death. (One recalls the famous scene in Dostoevsky’s Idiot, in which Prince Myshkin shivers when he looks at a copy of Hans Holbein the Younger’s depiction of the dead Christ in the tomb, hanging in Rogozhin’s house, and says that a man could lose his faith looking at such a thing. The tortured murderer-to-be Rogozhin, a man dominated by his passions, says that he likes it!). 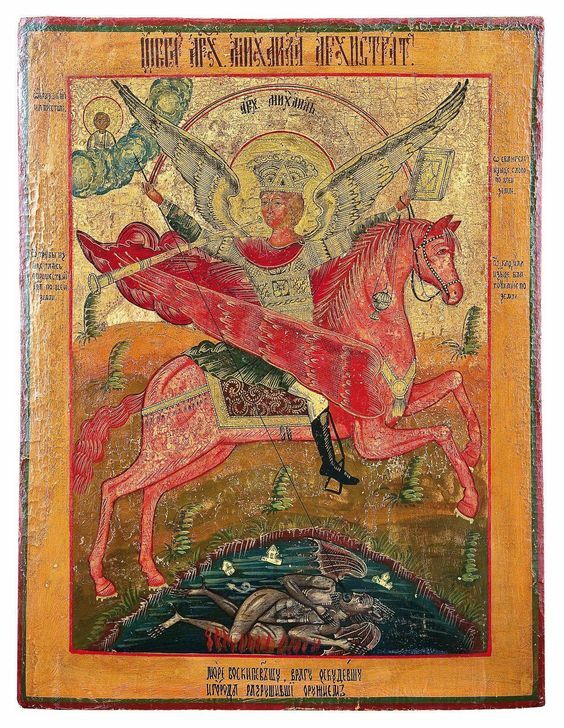 In regard to the saints: The purpose of an icon of a saint is to depict him in his perfected, deifed state, above all earthly changes, feelings, desires, pleasures and pains, not in the throes of some unhealed sinful or even blameless passion. The Renaissance painters do not have this as their goal, but rather they prefer to show the saints as passionate and sensual people, like the powerful personalities they admire in their own dynamic society. The “poster child” for Renaissance painting, the example that everyone is familiar with, is Michelangelo’s famous decoration of the ceiling of the Sistine Chapel at the Vatican in Rome. It is, of course, an amazing achievement, and it is also a glorification of the human body, depicting extremely fleshly characters in various stages of undress. The subjects are depicted as very fleshy, not ascetic, and immodestly dressed (or undressed! ), and they symbolize the entire period’s turn to a kind of neopaganism. The fact that the subject matter is from the Bible does not make this “sacred art,” but rather compounds the sin involved in the enormous expenditure of human ingenuity, labor, and treasure on what is, after all, a celebration of the rejection of the Gospel in favor of worldliness and corruptibility. Sculpture – The great sculpture of this period, with Michelangelo’s work, again, being the typical example, is a direct throwback to the pagan Greek glorification of the human form. Again, we have an enormous technical achievement in the service of worldliness. Michelangelo’s justly renowned Moses and David do not depict the sanctity, the otherworldliness, for which we revere these holy men who really existed, but rather depict a Moses and David that never existed – powerful mythological heroes, pagan demigods. Again, we have a pretense to naturalness, to conformity with the real, that actually is a form of plani/prelest – delusion. Architecture – Part of the neoclassicism of the Renaissance is the return to classical architectural features, such as the triangular arch and the three orders of the Greek columns. Certainly these are not inherently anti-Christian or worldly, having been features of the earliest era of church building, examples of which we enjoyed in our earlier class, and these features in themselves do not violate the true principles of sacred art. But there is a specific building project of this period, you might say the building project of the post-schism Western church, that symbolizes the whole complex of problems we have been discussing in regard to the Renaissance: the new St. Peter’s in Rome. St. Peter’s is not the cathedral of the pope as bishop of Rome. It is a martyrium, a pilgrimage shrine church built over the tomb of a saint, in this case, of course, the coryphaeus of the Apostles, St. Peter. St. Constantine built a beautiful basilica to serve as the saint’s martyrium, and over the centuries countless relics of the saints were translated there. Pope Julius II (the “warrior pope” who also sponsored the Sistine Chapel paintings) decided to tear down the old basilica and began a construction project that would take over a century to complete. Its financing through the sale of indulgences was one of the proximate causes of the Reformation (we’ll discuss that next time, when we talk about the origins of usury economics). The resulting building, which was eventually a combination of Renaissance and Baroque architecture, is simply enormous. It remains the largest church building in the world, covering nearly six acres and accommodating 20,000 people, and its dome is still the highest in the world. The overall impression is one of vast power and insupportable, overwhelming weight. It is glorious, but it is of this world. It is the perfect symbol of the extreme ideology of papism, which sees the pope as the direct spiritual monarch and indirect temporal monarch of the world, truly a typos of the Antichrist. HELP OUR WORK: KEEP FR. STEVEN FREE TO DO IT. Buy my new book, The Eternal Sacrifice at http://www.lulu.com/spotlight/FrStevenAllen. It is available both as a paperback and an ebook. If you have already purchased a copy, buy a few for gifts for your Orthodox friends or those interested in Orthodoxy. And pass the word on through your own social media. Those of you who know a pastor or church bookstore manager – give them a gift copy and encourage them to stock it! Just write me at frstevenallen@gmail.com to learn how.